Hendrick van der Burch (also Burgh), Dutch painter. 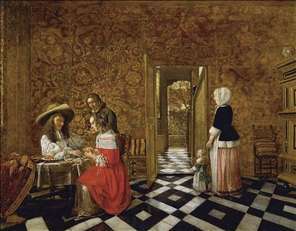 One of his sisters seems to have been Jannetje van der Burch, the wife of Pieter de Hooch, whose genre scenes of guardrooms, domestic interiors and courtyards closely resemble those of van der Burch. Van der Burch was living in Delft by 1642 and joined the Guild of St Luke in 1649. He cosigned documents with de Hooch in 1652, 1654 and 1655. Probably in imitation of de Hooch, van der Burch developed an interest in the expressive use of highly ordered, geometric space and sophisticated lighting effects, often employing a view to an adjoining space through a doorway or window. However, his command of perspective was never so certain and his lighting effects rarely so subtle as de Hooch s.
Van der Burch moved to Leiden in 1655 and acquired a house opposite the university; one of his rare signed paintings depicts a Graduation Procession at the University of Leiden (Amsterdam, Rijksmuseum). He had moved to Amsterdam by May 1659 but in the 1660s is recorded in both Leiden and Delft. Besides his genre scenes, he painted at least one group portrait and a river scene; a Susanna by van der Burch appeared in an inventory of 1703. See more details about "Merry Company at a Table"